The user program including the double precision floating point arithmetic instruction that is necessary for the coordinates correction, ST language and Function Blocks is executed fast, as well as the basic instructions and the special instructions. Integration of Logic and Motion in one CPU Synchronous control of all machine network devices: vision sensors, servo drives and field devices with the machine control network, EtherCAT. 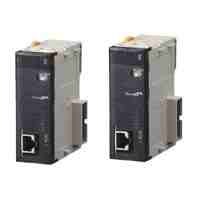 Synchronize the PLC Engine and the Motion Engine with the EtherCAT control period. Fast and highly-accurate control is possible. Simple positioning control with feedback. Position can be controlled by receiving a feedback pulse from the encoder. 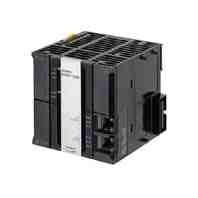 Up to 8 positions can be set in the Inverter. Sensors for positioning and Limit Switches can be reduced. High-accuracy positioning with fully-closed control. 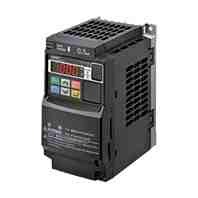 Servo Drives for 400VAC globally widens applicable systems and environment, including large-scale equipment. Safe design and Safe Torque Off (STO) function. Vibration can be suppressed in acceleration/deceleration even in low-rigidity mechanical systems. Inherited functions and performance of G5 series and EtherCAT communications achieve high-speed and high-precision positioning. Lineup of compact and high-thrust iron-core motor type and cogging-free ironless motor type with excellent speed stability. Same Iron-core motor type for 200V AC and 400V AC. Quick setup by automatic setup function. Fast positioning operation: taking from 0.15 to 0.4 ms (min.) 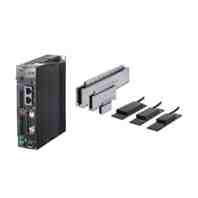 to start servo operation from PLC start command. 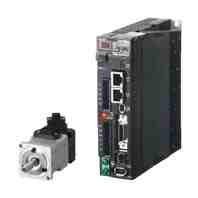 Support for Servomotors with Absolute Encoders. Monitor the Deviation between Axes during Linear Interpolation. A Wide Range of Positioning Operations. Comes with Memory Operation function. Common control interface with pulse-train type position control unit (CJ1W-NC4). Fast communication of EtherCAT (250 μs min. communications cycle). In addition to servo control, inverters, vision sensors, and other I/O devices that support EtherCAT can be connected. Support for Servomotors Speed Control and Torque limit outputs.